Got any plans for the weekend? I slacked BIG TIME on my cardio all week long, so I might go for a run on Sunday or brave a killer gym sesh with my favorite friend/enemy/calorie blaster, the Mighty Stair Stepper Machine. 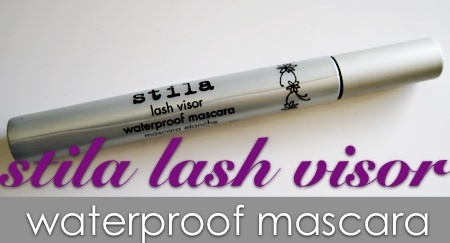 test drove Stila’s Lash Visor Waterproof Mascara, aka waterproof mascara hawtness! Stila’s Lash Visor Waterproof Mascara comes with the Foxy Barbie Loves Stila beauty can, but it’s also available separately for $12.50. I think it kicks my former favorite waterproof mascara, Shu Uemura Precise Volume Waterproof, in the boo-tay. One coat of Lash Visor, KAPOW! Lash Visor does everything Precise Volume does but does it even better. Both products have amazing all-day curl hold and lash lengthening abilities, but I’ve always wished for thicker lashes from Precise Volume. That’s where Lash Visor comes in. It holds the curl and lengthens lashes like Precise Volume does but goes a step further by delivering thicker lashes WITH a glossy finish. 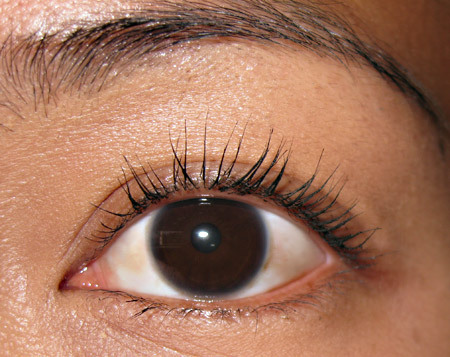 I wore one coat of Lash Visor to the gym last night, and after my sweaty struggle with the stair stepper, my lashes still held the curl and showed good thickness and length, with very little smudging, too. Oh — the best part? The price is waaaay right. At $12.50, Lash Visor costs half as much as the $23 Precise Volume. Right now I’m rockin’ Lash Visor and taking a break from work. Tonight I have massive amounts of laundry to tackle (it never ends). If I can get it done early I’d like to hit Sephora to check out DuWop’s new Circle Block concealer for dark circles. How’s it going on this lovely Friday, pretties? wow, that mascara makes a difference! Haha, the stair stepper machine. I’m actually pretty good on it as long as A) I don’t let go and B) give myself a mantra to do them right (I’m weird, I know) and C) never ever attempt to change the music. My gym enemy (when I was in physical therapy) was le diable treadmill. I did a Fred Flinstone when the therapist asked me to let go of my hands–I walked backwards somehow by walking normally and slammed head first onto the treadmill after falling off it from going backwards. EVIL MACHINE for clutsy people. ABSOLUTE EVIL!!! I can do the bike exercise machine all day though. I love bicycling. I used to be able to do six miles. My bicycle needs air in its tires and it probably needs its brakes looked at before I can get back in bicycling shape and the weather needs to warm up; it’s back down to THIRTY THREE degrees…22 with the wind as it’s blowing over the lake. Brrr. I should probably do my laundry. :glances at overflowing laundry bin: And I should probably wash my sheets as I haven’t done that since….December? I don’t remember. I hate washing my sheets. They’re heavy little suckers. I should do some spring cleaning period. I hate cleaning. Zena thinks I’m nuts when I clean. I LOVE STILA. That is all. lol… But seriously, Stila always delivers. I’ve been hooked on Stila products since ’06 when my first roomie had hundreds of dollars worth of Stila goodies. 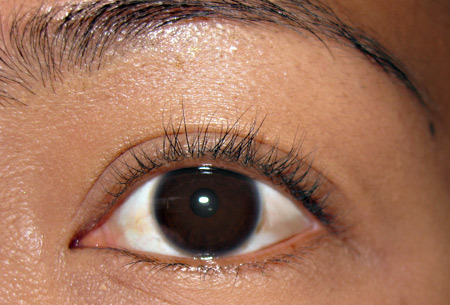 Unfortunately for me, I found out on Tuesday or Wednesday that the nasty little red eye I had was caused by something my eye doctor called “a corneal ulcer.” 🙁 If you can read my mind, then you certainly know that this means: 1) no contact lenses (FOR A WHILE! ), 2) No eye makeup either :[ Talk about a bummer! I’ve had to visit my eye doctor so many times within the last few days and take antibiotics, it’s not even funny. I spoiled myself and bought a new mascara (I don’t want to risk using the old one — bacteria = bad) and a green eyeshadow from Maybelline. I wish I could use both! Hey Karen! Wow, that is so cheap for something from Stila! I actually have this mascara from the tin but I haven’t tried it yet. Now I need to! Happy Friday! I’m off to have mexican food with my mama! Ooh your lashes look very pretty. 🙂 It reminds me of CoverGirl VolumeExact. Have you tried it? I’m wearing it right now. I probably don’t need any more mascaras right now, since I have like 5 or 6 in rotation. Tonight I’m going to watch the finale of Battlestar Galactica. Waaa my broken geeky heart. But it’s going to be fantastic, I just know it. Arianne´s last blog post..My Makeover. I use the step machine too – it’s useful for when I’m feeling lazy, you’re forced to keep up with it! LOL. I had a good Friday. One lesson to teach (about the USA by the way) and then retro pianoparty this evening (well night) and I had a lot of fun. I’ll need it because now it’s studying for the rest of the weekend: Swedish exam on Monday… scary! Hi! I’m new to this website but I love it already!!!! But I do need some beauty advice. I’m going to a new high school in the fall and want a good school look that will last through my sports practice and musical rehearsal. I am really fair and have blonde hair and blue eyes and LONG LONG LONG eyelashes. So I want a waterproof mascara that basically gives it all. And a pretty eyeshadow maybe? I dont know but thank you in advance and for the blog–it is the highlight of my day to come and read your posts!!!!! P.S. i want to be a makeup artist when i am older–any tips for learning tecnique? I know! I was really surprised by how good it was. I didn’t make it to Sephora yesterday (ugh, laundry! ), but I’m hoping to get there today. Will let you know if I end up snagging the DuWop. My circles are looking ROUGH these days. Anybody have any tips for taken lash visor off? Last night it took me two different eye make up removers and like 10 cotton balls. It has got to be easier than that! Wait Karen! Is this $20 now??? Whatttt happened.